Learn the story, history and symbolism behind New York City’s most iconic monument, the Statue of Liberty. 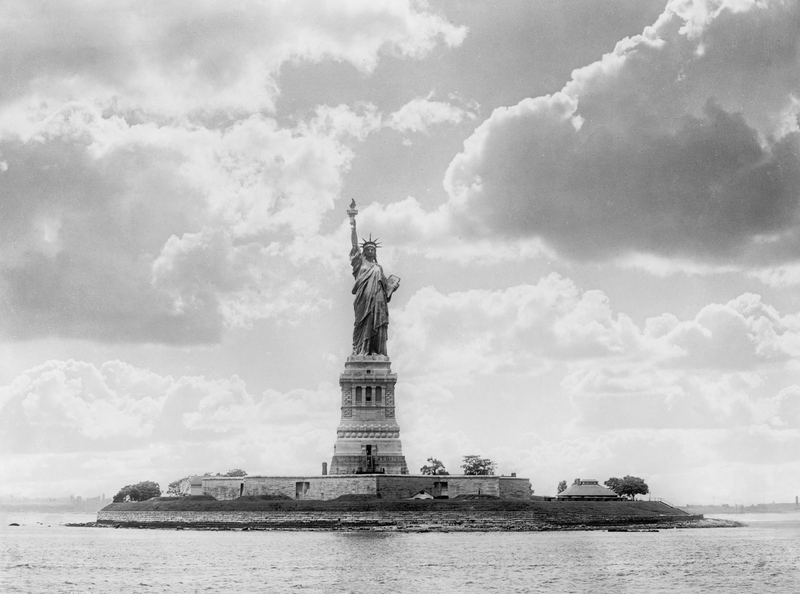 Lady Liberty found her home in the waters of New York Bay on Liberty Island in 1886, and quickly became an international beacon of hope to more than 9 million immigrants in the 19th century. A centennial gift to the United States from France, the Statue of Liberty was originally the brainchild of poet and antislavery activist Édouard de Laboulaye. Laboulaye believed that celebrating America’s newfound democracy after the Civil War, as well as the abolition of slavery, could also strengthen France’s democratic ideals. 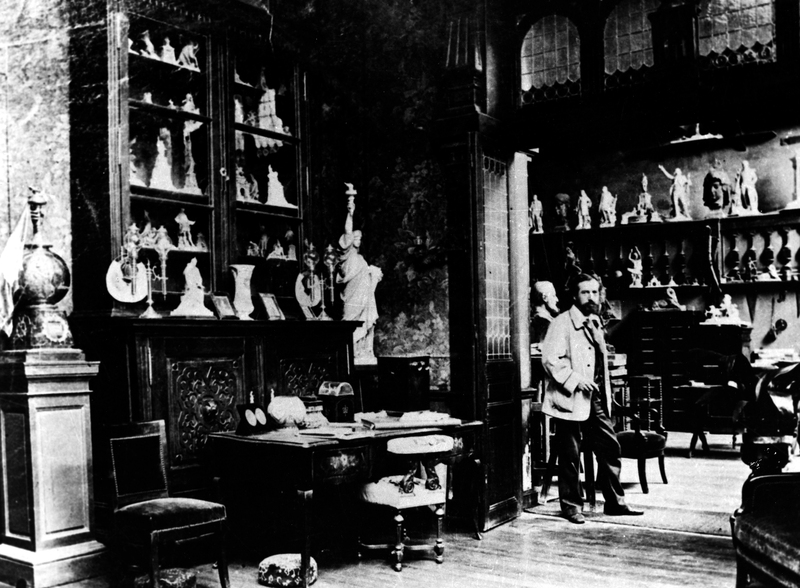 Young French sculptor Frédéric Auguste Bartholdi, who had already been experimenting in large-scale works, eagerly supported Laboulaye’s idea of a statue and began drawing up designs. The final version of his design was patented in 1879, and construction began soon thereafter. 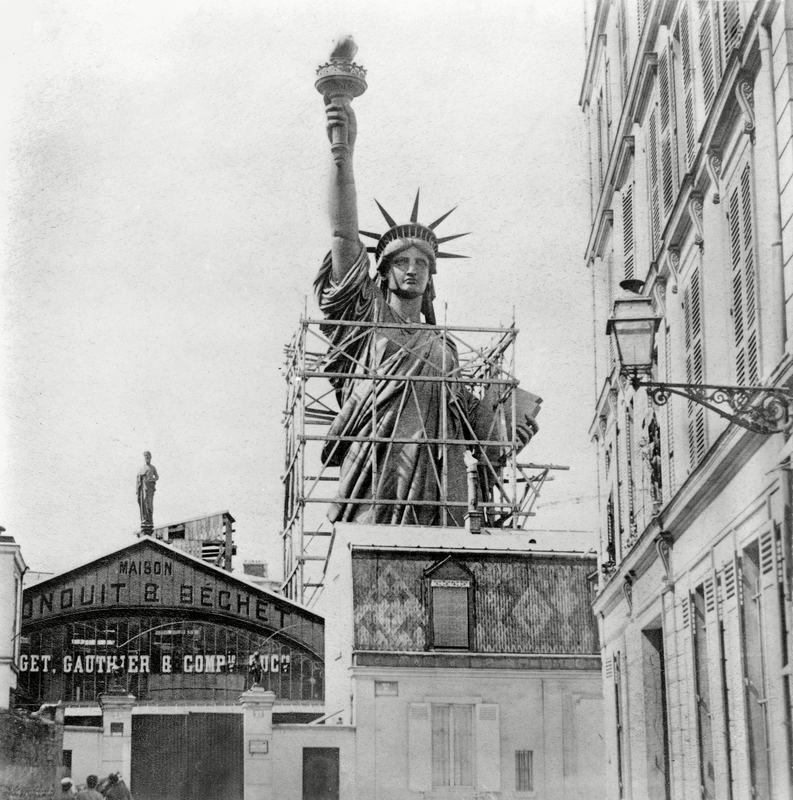 Bartholdi’s design was colossal – bigger, in fact, than any other sculpture in the world at that time. Eventually Alexandre Gustave Eiffel, the designer of the Eiffel Tower, proceeded to design the statue’s skeletal framework. Eiffel’s structural-engineering expertise was paramount to keeping the statue upright and secure; the iron interior would bear the enormous weight of 450,000 pounds (200,000 kilograms) while still allowing the 100 US tons of exterior copper to move independently. 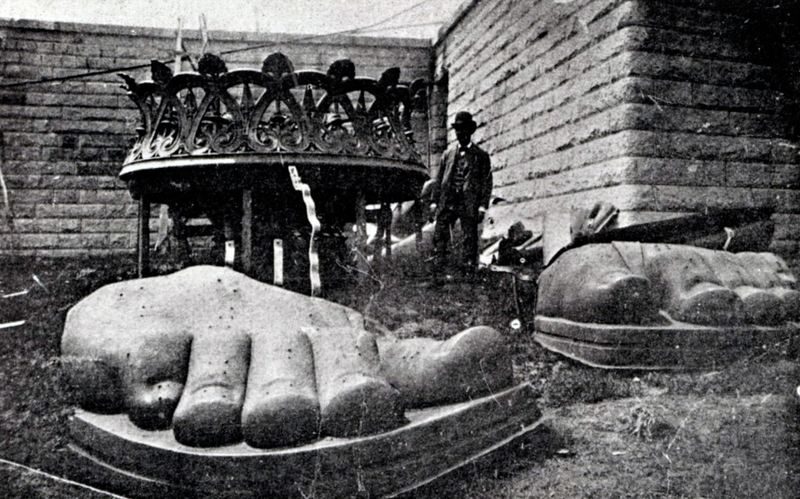 Constructing the statue wasn’t an easy feat, and not only due to its size. The United States was responsible for building and funding the 89-foot (27-meter) stone pedestal, while France focused on the statue itself, as well as shipping the sculpture in 350 pieces across the Atlantic Ocean. Both countries had funding issues, so they turned to the public for help, eventually receiving construction funds through art events, auctions, donations and public fees. Joseph Pulitzer, publisher of The World in New York City, played an important role in persuading the American public to contribute to the project. In exchange for monetary donations for the pedestal, Pulitzer printed donors’ names in his newspaper, resulting in what is now considered to be the United States’ first-ever crowdfunding campaign. And it proved successful. 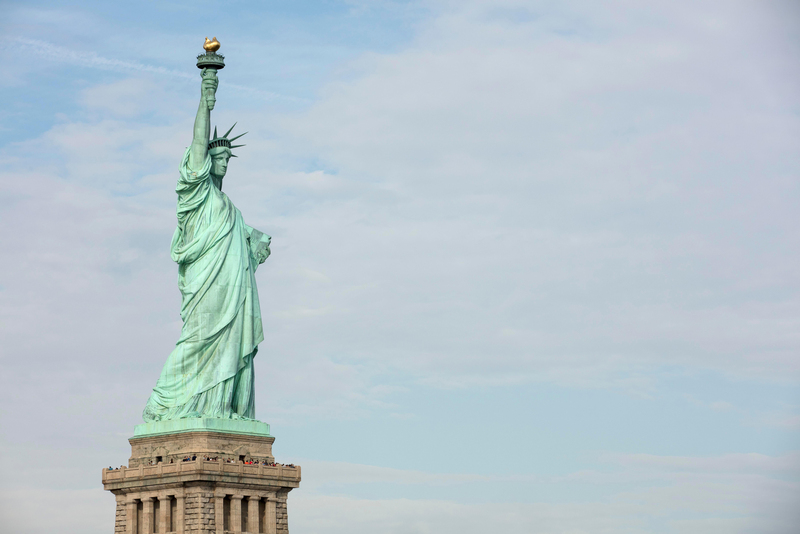 Named after the Roman goddess Libertas, the robed lady’s full name is Liberty Enlightening the World. Made from iron, steel and 300 layers of hand-hammered copper, she stands approximately 111 feet (34 meters) tall, but if you measure the foundation, pedestal and torch, her full height is 305 feet (93 meters). Her right hand extends upwards to hold a 24-carat-gold gilded torch, and on her head sits a seven-pointed crown, symbolizing the seven continents and seven seas. At her feet lie broken shackles, which represent a woman free from oppression and tyranny. Her signature sea green color, also known as a patina, is the result of the natural weathering of copper, which covers the entirety of her exterior. The base of her pedestal contains a bronze plaque inscribed with a sonnet by American poet Emma Lazarus, containing the now famous lines “Give me your tired, your poor / Your huddled masses yearning to breathe free.” This has come to represent not only Lady Liberty herself but the original essence of America. Today, the statue is visited by approximately 4 million people each year.